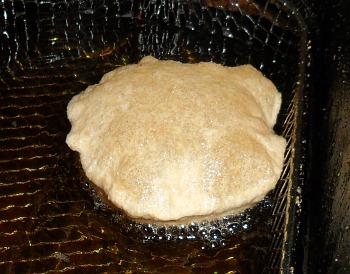 flatbread around 7-10cm in diameter. 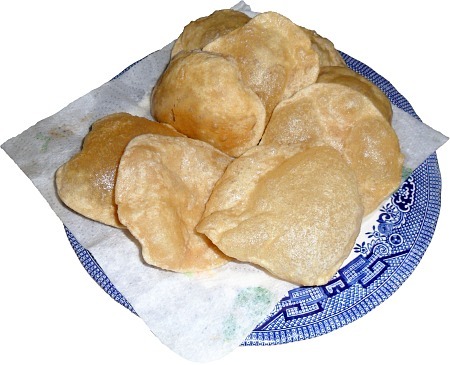 Puris are small - around 7 to 10cm in dimaeter - and made from either white or wholemeal flour. 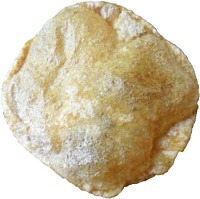 Luchis are slightly larger - around 10 - 12cm in diameter - and made only from white flour. That is as far as their names go. We are only making a small quantity of dough because this makes quite a few and they are also a bit greasy. Also, note that you can substitute the Chakki Atta with strong white bread-making flour if you want. In a clean bowl, mix the flour and water to make a dough that is not too stiff. Knead it and then roll it into a ball, cover it with a cloth and leave it for 10-20 minutes. Put the deep oil fryer on to 180 Celsius. Either: Put some oil on your hands and take the dough out of the bowl, pinching off enough dough to make a ball around 2cm in diameter (3cm for luchi), and place it in the bowl. Repeat the last step until all of the dough has been rolled up into balls - the oil on your hands should stop them from sticking to each other. Put your finger in the oil and then dab a drop of oil onto each ball. Take one of the balls out of the bowl and roll it flat with a rolling pin until it is around 3mm thick - the oil will stop it sticking. Note that we are not rolling these out on flour - the reason for this is that we are going to fry them and having flour around will just make a mess of the oil in the deep fat fryer. Try to make the thickness uniform so that they cook evenly. Next, pick them up and lower them into the oil. this and similar jobs. It is quick and easy. 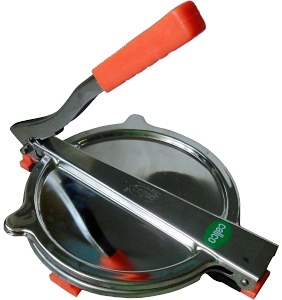 Or: Use a puri press. 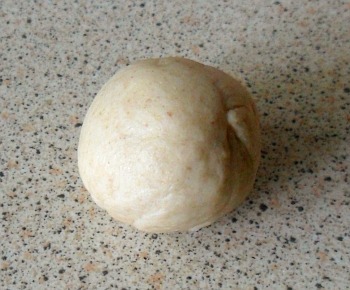 Without using any oil, divide up the dough into even pieces so that you can roll a ball of the required size, and then place the doughball on a sheet of plastic in the press. Place the other sheet of plastic over it and press it until it has the requried diameter - around 5 seconds. Peel off the top piece of plastic and put the puri/luchi on your hand. 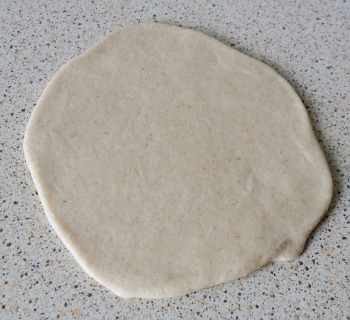 Next remove the other piece of plastic and immerse the flattened dough into the oil. One thing that you will notice from the puri press is that its results are perfectly round - as well as quick. They should sink for around 5 seconds and then start to rise. Almost as soon as they have started inflating, turn them over to allow the other side to cook as well. Keep on turning them over so that they cook evenly. Remove when they are brown enough for you. Drain them and then put them on a kitchen towel to soak up any further oil. When cooked off, they should be soft - not hard and brittle. Like the Roti, they have been steamed from the inside whilst they have cooked. These are handy and small but they are fairly greasy when compared to roti and chapatti so you are probably better off eating them with something with a sauce like a curry. depending upon size and so on. Substitute the chapatti atta with white (strong plain bread) flour. Add any powdered spieces you like to the flour before adding the water.